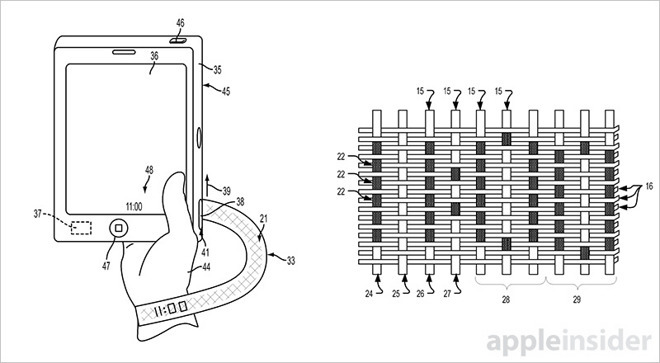 The U.S. Patent and Trademark Office on Thursday published an Apple patent application describing a method by which light-transmissive materials like nylon are interwoven into conventional textiles, literally creating a woven display for use with devices like Apple Watch. Aptly titled "Woven display," Apple's application details a technique of weaving light pipe fibers into conventional fabrics, a clever amalgam of traditional textile production and modern materials. 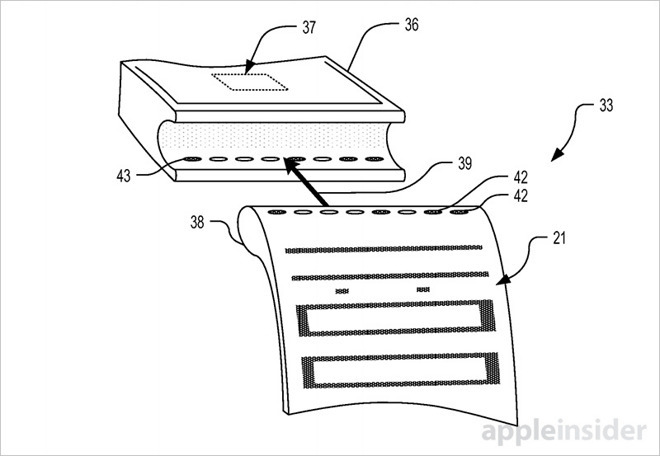 The resulting smart fabric would have a multitude of uses, one being an Apple Watch band that doubles as a simple secondary display. The basic theory behind Apple invention is to lay down light transmissive fibers alongside opaque fibers to form a precise pattern. The document proposes filling the weave's lengthwise yarns, or warp, with light pipe fibers and the over-under yarn, called the weft, with traditional material. Alternatively, opaque fibers might constitute most of the warp, while light fibers are included in the weft. In one embodiment, Apple proposes weaving multiple fiber sources, including specialized fibers like glass, polymers and nylon, into a cohesive flexible band. Using modern tools like computer controlled three-dimensional knitting equipment, it's possible to accurately weave a variety of fibers into complex spatial designs. Alternatively, light-transmissive sections of the band can be made opaque during the finishing process by applying a light-blocking substance. Once weaving is complete, the light pipe fibers can be connected to a light source, such as an LED. By varying when and where these light sources illuminate, the woven display can present a user with readable information. For example, light transmissive areas can be selectively illuminated to display the time, temperature or any other arrangement of alphanumeric characters. If multicolored LEDs are employed, the entire band can be glow red to denote a system notification, or perhaps flash yellow for a low battery alert. Apple specifically mentions a wristwatch type device as an example use case, as seen in the image above. Light pipes in the woven band line up with LEDs embedded in the watch body, in this case disposed in the crevice of an attachment mechanism. Apple Watch's sliding magnetic lug solution would be a perfect match. Alternative embodiments cover similar woven displays integrated into iPod-style wrist loops for iPhone, MacBook chassis surfaces and more. The document also details substitute methods of illumination, a rundown of suitable fiber materials and a deeper look at weaving techniques, among other minutiae.